We lead and facilitate grassroots events, projects & programs to join lives and build community. 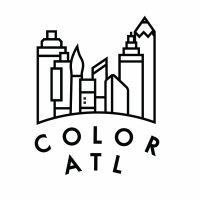 ColorATL is a community of creative placemakers intentionally shaping culture and environments through the arts. We facilitate social connections that positively impact a community’s quality of life. The Atlanta-Based Adult Coloring Book – Created exclusively by Atlanta-based artists, our goal is for the community of Atlanta to intimately connect with local art while experiencing the benefits of creative action. The backbone of The ColorATL Coloring Book is our 1-to-1 model: For every coloring book purchased, we deliver a free copy to someone at our local, partnering health and social impact organizations. We believe those in difficult circumstances deserve access to the therapeutic benefits of creative activity. Creative Connections – We connect local artists with people in health facilities and marginalized communities throughout the city, constantly observing how the creative process decreases stress, anxiety, and despair – and cultivates peace, joy, hope and connection. Community and Event Activation – We facilitate the process of collaborative community-created art. Learn more and Purchase your Coloring Book. In the South Atlanta Neighborhood we are primarily focused on building community with the young people in the neighborhood. Neighborhood Youth Group – The youth group focuses on young boys and girls to build connection, purpose, and worth. Weekly community gathering including sharing in fun, a meal, life skills and Bible study. Neighborhood Sports – Twice a year we host basketball tournaments for the neighborhood. We also organize a flag football league. 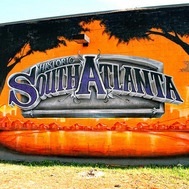 South Atlanta Sisters – S.A.S. focuses on the young women of the neighborhood in order to develop a sense of community, support and identity. Neighborhood Prayer Walks and Networking – Once a month we walk the neighborhood praying for neighbors and the common good. We share a meal together and join our lives together. 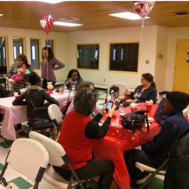 In this historic neighborhood we focus on building community with vulnerable women and the homeless by providing spaces and programs where persons with disparate lives can join together and learn how to be neighbors and friends. This diverse community is open to all who would like to visit and participate. Parish Walks – We spend time walking the neighborhood, connecting with neighbors on their terms, praying for one another, and checking up on our more vulnerable community members. Women of Worth (W.O.W.) – We gather weekly to create space where friendships can form and reconciliation can take place. We share, laugh, study Scripture and pray together to connect and help us all work through the struggles of daily life. Our members take leadership in the group, creating a family environment. We extend an open invitation for all ladies, no matter your background, to join us. Creative Connections – We bring together people from different walks of life to come together and have fun, get to know each other and build transforming friendships while creating together. Community Conversations and Bible Study – Twice a week we invite the community to come together to discuss current events and issues, and wrestle together to discern how Scripture helps us to think about these topics. Sweet Auburn Saturdays – We gather together weekly for a mini-block party where we have fun with games, art, snow cones and coffee. 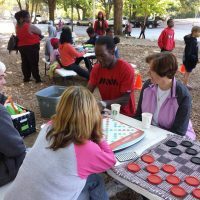 Giving Grace is a network serving individuals in our communities with acute needs, supporting ongoing community programs, and inviting the larger Atlanta community to participate in the work of reconciliation. + Respond to immediate emergency needs as they present themselves. + In cooperation with community directors and those in need, help create and support a sustainability plan moving beyond the emergency need. + Provide financial and human capital to support our ongoing work and mission. + Connect persons across social and economic divisions. Email for more information. Contribute through Giving Grace here.